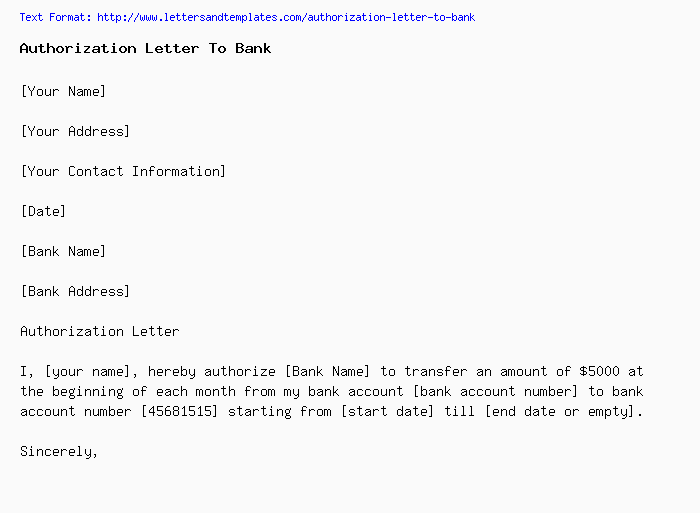 I, [your name], hereby authorize [Bank Name] to transfer an amount of $5000 at the beginning of each month from my bank account [bank account number] to bank account number  starting from [start date] till [end date or empty]. I, [your name], hereby authorize [Mr. John Smith] to act on my behalf in transactions related to my bank account number  with [Bank Name] including [withdrawals, deposits, loan settlements, etc.…] but excluding [fixed deposits, etc.…] starting from [start date] till [end date or empty]. [Mr. John Smith] may sign all necessary documents and perform corresponding actions within the scope described in this letter. The authorized person’s identity proof details and signature are provided below for your reference and verification purposes.